As a Torontonian, it’s not unusual to see white guys shake hands while greeting each other with a, wa gwaan? I wouldn’t say I particularly enjoy witnessing this — actually, it can feel quite painful — and it’s even worse when they point to the man dem over there, or unfurl several bombaclat’s. I wanted to crawl into a hole that time I encountered a bunch of dudes shouting “Gaza mi seh!” Over the past few years, most certainly because of Drake, these instances of public patois faux pas have increased. It seems like everyone has a take on what they perceive as Drake-cabulary — phrases like come through or ting or from time — without realizing Drizzy slang is Toronto slang, which, in turn, is adapted from Jamaican patois. So does anyone actually know what the hell they’re saying? Patois, as well as its hybridized diasporic slang, is a language used by fluent, native-speaking migrants, second and third-generation Jamaicans, along with non-Jamaicans across the US, Canada, the UK — even Japan. But its cultural prevalence can’t solely be attributed to migration: dancehall and reggae, musical genres thick with patois, have had a presence in the mainstream since as early as the ’70s, and continue, in waves, to engage the pop charts. In the last year alone, Jamaican musicians like Sean Paul, Spice, Popcaan, and Mavado have worked on high profile collaborations with pop artists. 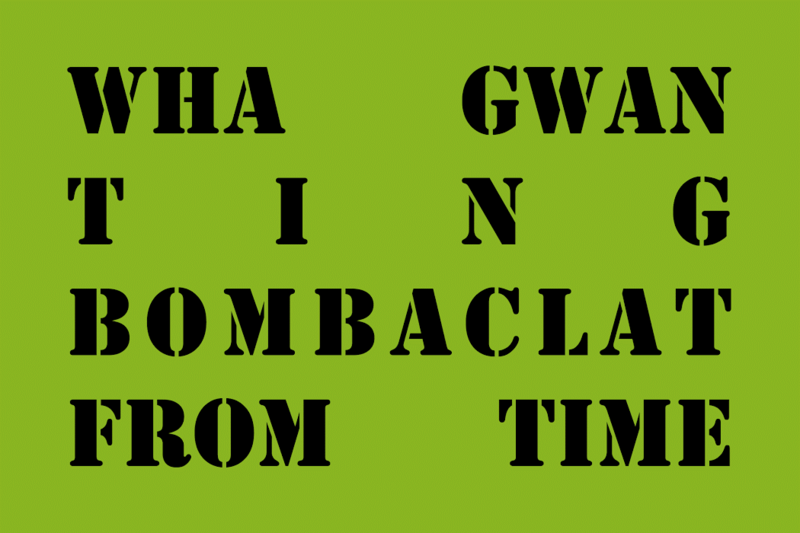 Part of understanding Jamaican patois absorption into mass culture involves understanding its synthesis; and scholarship suggests it might not have even originated in Jamaica. Hubert Devonish is a linguistics professor at the University of the West Indies at Mona, Jamaica. He told me that while no one can be sure, some linguists believe patois began as an Afro-English language, either in Saint Kitts or Barbados, the first permanent British colonies that were founded in 1624 and 1627, respectively. A true hybrid language was formed as a result of European and West African contact due to the transatlantic slave trade. “The critical thing about these creole languages is that they tend to borrow most of the vocabulary from the European language,” he said, “but that the pronunciation patterns and grammatical structures are West African. Between 1700 and 1834, West African slaves, including those already in Saint Kitts and Barbados, were sent to Jamaica to work on profitable sugar plantations. Colonizers and slave masters forced these people to speak English to prevent clandestine talk of slave rebellion or other communication in their native tongue. This mash-up of literal ‘broken’ English combined with fragments of West African languages became ‘pidgin’ — meaning it wasn’t a native language but rather, a mix of dialects. And as generations passed pidgin became a stabilized, natural language, thus forming the Jamaican creole that is referred to as ‘patwah or patois, meaning ‘rough speech’ in French. It seems like everyone has a take on what they perceive as Drake-cabulary without realizing Drizzy slang is Toronto slang, which, in turn, is adapted from Jamaican patois. So does anyone actually know what the hell they’re saying? En masse migration from Jamaica to the UK, US, and Canada began in swift succession, with the post-war Windrush of West Indian immigrants arriving to Britain in 1948. Jamaican music became popular overseas starting with ska and rocksteady in the ’50s and ’60s. Reggae emerged in the 1970s and Bob Marley was the genre’s central figure. White people liked Marley but they couldn’t understand him, and neither could journalists. In order to target that audience, Christopher Blackwell — founder of Island Records, responsible for Bob Marley and The Wailers’s mainstream success — added more rock n’ roll elements to Marley’s songs and, as his fame grew, the patois lyrics were swapped for Standard English. Sonjah Stanley Niaah, author of DanceHall: From Slave Ship to Ghetto and director of the Institute of Caribbean Studies and Reggae Studies at the University of West Indies at Mona Jamaica, links global fascination with patois to the music. “Jamaica is the only country in the latter half of the 20th century to have given the world seven distinct [musical] genres,” she said. “[Listeners] are attracted to the rhythm first, then realize they don’t understand the words so they look them up.” The digital era has compounded music fans’s ‘access’ to patois, but pre-internet curiosity necessitated interacting with Jamaicans or other West Indians to understand, or you’d rewind your cassette or hit repeat on a CD player dozens of times. Despite the proliferation of patois beyond native speakers, the belief that it is uncivilized or an improper way of speaking’ is still prevalent. This is due to the negative image of Jamaica and dancehall music as being too sexist, sexual, violent, homophobic, and misogynistic. Dancehall can cause a “moral panic” for non-Jamaicans, said Niaah, but she doesn’t think there’s malice in the criticism. “In some ways, that’s how humans respond to difference,” she said. Still, we can’t overlook the fact that dancehall’s success has given Jamaicans — especially women — at home and in the diaspora the confidence to express their culture instead of rejecting it or assimilating. And patois is such a strong part of identity that diasporic West Indians are taking to social media, blogs, and publications, questioning whether the mainstream adoption of dancehall, and subsequently patois, is an indicator of success for Jamaican artists, or whether it’s appropriation or exploitation. Funny, but not always offensive. Native speakers like Niaah and Devonish are thrilled people outside Jamaica want to learn and adopt the language. Devonish helped design a Jamaican patois creole course for students at York University in Toronto. Course director Clive Forrester said it was developed after students suggested adding a Caribbean creole course, specifically Jamaican patois, to the linguistics department. Enrollment has been near or at capacity since it launched three years ago. “Students from all ethnicities do the courses,” Forrester said, “Jamaicans, Canadians, Eastern European, South Asian… you name it." Patois is more than just an island ting: it’s a language holding Jamaicans around the world together. Tension surrounding patois isn’t just an overseas thing; it also exists in Jamaica. According to the 2005 Language Attitude Survey of Jamaica (the first official survey done in Jamaica on the perception of language) over 50 percent of people believed those who speak patois are less educated, less intelligent, and made less money than Standard English speakers (although 40 percent did admit to thinking patois-speaking people are more friendly). Not much has changed today. Speaking in patois is relegated to informal interactions — conversations with friends and family — while Jamaican Standard English is the country’s only official language and used in formal settings like government, work, school, and with strangers. There are massive public debates about making both English and patois official languages, and many activists and scholars are trying to reclaim patois, rooted in trauma and resistance, by calling it ‘Jamaican.’ This is because the word patois suggests a non-standard dialect of French and not a distinct language. “We do this to make it clear to both Jamaicans and overseas people that this is a language associated with a nation,” said Devonish. Patois is more than just an island ting: it’s a language holding Jamaicans around the world together, and this is why its transformation into slang used casually by outsiders is troubling. Mainstream pop has found a way to capitalize on dancehall, a sound predicated on patois, without putting much effort into creating sustainable relationships with the Jamaican music industry or eradicating racist stereotypes about its origins. But patois is a language built through exploitation, death, and enslavement as much as it’s now a permanent symbol of community, healing, and resistance — and it should be spoken with the understanding that it’s a language of freedom.